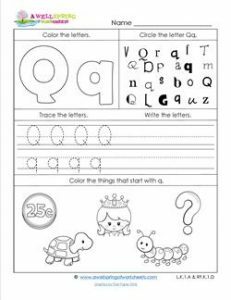 Just like all abc worksheets come in all different shapes and sizes, so do the Q’s on this page. If you take a good look at the Q’s in the box on the top right you’ll find all different kinds of Q’s. Can your kids pick them out? There is one upper case and one lower case q in each row. The bubble letters are a bit different, too. And the upper case letters to trace are oval rather than round. No matter which way you write it, a q is still a q.